Firedamp, Methane(CH4), Blackdamp or Stythe. Carbon Dioxide (C02), Carbon monoxide. Properties of Liquid Air. Storage of Liquid Air. The Dewar Flask. Reviving Apparatus. Liquid Air Type. Liquid air is pale blue in colour, this being due to the blue colour of liquid oxygen. It has a temperature of approximately minus l96°C. Under certain safeguards, selected and trained first aid men in the coal mining industry have the privilege of being allowed to use, in an emergency, a preparation of morphia for the alleviation of suffering. A deputy's lamp has a silver top. Above right:- If it goes out, while down the pit, it can be re-lit, using the striker. There were two broad types of breathing apparatus in general use for the purpose of affording respiratory protection against poisonous or irrespirable atmospheres. This consists of an inner and outer vessel, both made of spun copper, in contact with each other only at the neck joint. Proto Apparatus, Blackett's Aerophor, Brown-Mills Type, Savox Apparatus, Self Rescuer, Aerorlox. In 1912 there were two types of self contained breathing apparatus used at Ilkeston, one using liquid air, 'Aerophor' and one using compressed oxygen contained in cylinders, 'Meco'. An apparatus making use of oxygenated air evaporated from liquid air was produced in the East Midlands Division of the National Coal Board around 1955. It contains two documents I produced describing the measurement of environmental variables (air flow, methane carbon monoxide, dust, pressure humidity, noise, etc) in coal mines and the part this played making mines less dangerous and unhealthy places to work in. The book on air flow measurement was derived from a master's thesis I produced for Nottingham University in the late 1980's. 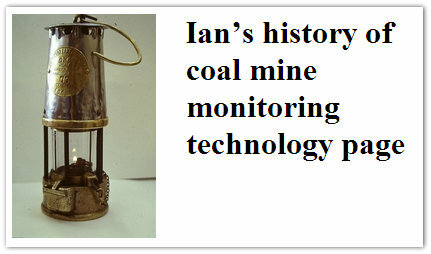 The second, Mine monitoring for Safety and Health, was derived from research I undertook leading up to and following the termination of mining research at the Bretby site, South Derbyshire, where I had worked as an instrument development engineer for nearly 20 years. I have made both documents free to download from the web. Clearly, if any use is made of their contents acknowledgement of source would be much appreciated.